Average Height	: 14" - 16"
This is an ancient breed that has contributed to the development of all other Tibetan breeds, including the Shih-Tzu, Lhasa Apso, and the Tibetan Spaniel. 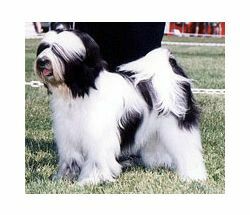 The Tibetan Terrier is not actually a Terrier at all. They were originally kept by Tibetan Monks almost 2,000 years ago and were considered good luck charms. The monks refused to sell them, but often gave them as gifts. The Tibetan Terrier was never sold to anyone, and the only way to get one of the dogs for yourself was as a gift from one of the monks or another grateful owner--a gift just like the one that finally brought the Tibetan Terrier to the Western world. The Tibetan Terrier was almost completely unknown in the West until the 1920s, when a British surgeon in India was given a female of the breed as a gift for saving the life of a local woman. His colleagues had never seen a dog like the Tibetan before, and after the surgeon entered the rare breed in an Indian dog show, the judges made a special effort to acquire a male of the species from Tibet. After the dogs had been breeding for several generations, the surgeon--one Agnes Greig--retired to England to begin breeding the dogs full-time, popularizing the breed in the West. Yet although the Tibetan Terrier remained unknown in the West for a great deal of time, the dog has a long history in the East as a temple dog, a herder, and a companion for the monks of various disciplines. You'll also want to spend a great deal of time with your Tibetan Terrier simply because they're so smart. This makes them a very appealing breed in some ways--they're extremely trainable, friendly, outgoing, and adaptable to whatever your habits and customs are. But in some ways--and at some ages, the first fourteen months or so of the dog's life being the crucial age we're talking about here--the breed's intelligence could make you think that the name "Tibetan Terrier" is even more of a misnomer than we've said: "Tibetan Terror" might be more accurate. It's not that the Tibetan Terriers show any ill will toward you. It's simply that they're too smart for their own good sometimes. Tibetan Terriers have been known to figure out from simple observation how to unlock their own puppy crates, how to find their way out of locked rooms, and any number of troublesome (yet precocious) practices. Can you break them of these bad habits? Yes, you can--but only by appealing to the dog's native sense of intelligence and curiosity, by turning the positive behaviors you want to reinforce into puzzles that the dogs themselves can solve. Negative training will simply create resentment, and the Tibetan Terrier will just go on its merry, destructive way. Although the Tibetan Terriers are highly friendly and highly intelligent, they can be sensitive about being touched. It's important to develop a sense of familiarity with them slowly and carefully--don't simply expect to cuddle up to your Tibetan Terrier in the first week. Tibetan Terriers tend to mature more slowly than most dogs, so you'll want to carefully and slowly train them over a great deal of time while introducing acceptable levels of physical contact. If you can do this, the Tibetan Terrier will eventually come to trust you completely and to behave appropriately--allowing you to appreciate the breed's qualities of companionship, intelligence, and adaptability all the more. The Tibetan Terrier has lived and thrived for centuries--if not millennia--virtually unchanged. This speaks well for their overall Health. The Tibetan Terrier has a long and beautiful coat--which means that it also requires a great deal of grooming. Expect to give your dog a good brushing at least once every two to three days, and more during certain stages of the dog's life. Once the Tibetan Terrier reaches adulthood, you can resume the more relaxed two-to-three-day grooming schedule. Avoid brushing the dog when its coat is dry--use a small amount of water, preferably from a spray bottle. If you have conditioner meant for dog hair available, by all means use it to ease the grooming process and promote the overall health and appearance of your dog. You should spend some extra time on the dog's beard, leg joints, and feet--any hair that builds up between the foot pads of a Tibetan Terrier needs to be removed. What's the upside of the breed, as far as grooming goes? Almost no shedding--if you brush the dog regularly. Tibetan Terriers are an ideal breed for allergy sufferers (or inconsistent housekeepers) for just this reason. Whatever daily living situation you and your Tibetan Terrier share--whether you spend all day in the fields or spend all day in front of the TV--it's vital to allow your Tibetan Terrier to get some needed exercise. One walk a day isn't sufficient for this breed: get them out there into the world to run around whenever it's convenient, but at least twice a day. Alternatively, if you have a good, secure yard through which your Tibetan Terrier can run and play, you might rely onthat in lieu of a walk or two now and then. Whenever you're walking your Tibetan Terrier, make sure of one thing: don't let them off the leash. Tibetan Terriers have a mischievous streak coupled with a high degree of intelligence, which is a recipe for frequent attempts to escape and explore this curious world they find all around them whenever they're outdoors. The Tibetan Terrier also thinks nothing of making you chase him or her as far as he or she wants to go--it's one more way of showing their affection, in the dog's mind. So allow them to channel their affection into more appropriate channels--save yourself some energy, as well--and make sure the dog stays on the leash during exercise. The intelligence of Tibetan Terriers makes them an ideal breed for training--if the trainer knows what he or she is doing. Intelligence, after all, cuts both ways--it makes it easier for the dog to learn how to do certain tricks or perform certain acts of obedience, but it also makes it easier for the dog to learn how to train its trainer in return. Because of this fierce intelligence, you'll have to keep two things in mind when training a Tibetan Terrier. The first is to never use negative methods of training: spray bottles, unpleasant odors, harsh language, and certainly not rolled-up newspapers. Tibetan Terriers will simply ignore you or rebel against the negative methods of training without modifying their behavior in the slightest. Instead, use positive methods of training--treats, affection, play--in order to convince them to solve the obedience puzzles or tricks you set for them. To a curious Tibetan Terrier, the work of solving puzzles is in many ways its own reward--but it certainly doesn't hurt to provide the dog with a more immediate reward as well. You'll also have to keep completely consistent while training your dog. Make sure that they understand exactly what they have to do in order to be rewarded, and don't let them "sweet-talk" you into giving them a reward without doing the expected work. Remember, the Tibetan Terrier loves puzzles, and the behavior of his or her trainer--the one who gives him or her treats, after all--is one of the most useful puzzles the dog has to solve. Keep your behavior consistent, set the dog achievable objectives every day, and be prepared to spend the necessary time so that the dog can master specific pieces of training.